It never really occurred to me that people might actually want to talk to me about the book. I don't know why. There have been countless times while reading that I wished I could ask the author why they made a certain choice, or how they came up with the idea to do that thing that blew my mind...So why I thought it was so strange when someone approached me and asked if I'd be open to visiting their book club is beyond me. Because I'm rather quiet and consider myself quite shy, I suppose I make the mistake of thinking I'm not very interesting. There's nothing glamorous about writing. It's dirty hair and late nights and closed doors and too much coffee. But in the end, there's a story. And people want to talk about stories. Being an indie author means you walk through every door that's open to you. So I agreed to go. I was nervous and had no idea what to expect, but I thought if each person who attends talks about it with one other person, that's another potential book sale. And let's be honest, I want to sell as many copies as I can so I can quit my day job so I can afford to invest more into my future as an author. It was nearly dark when I got there. I pulled my van in behind someone else who'd just arrived. I watched her climb out of her car and place a book—my book—on the roof of her car while she gathered her other things. But then I thought WWTD. (What would Ted do?) And I straightened the same shirt I wore when he had his arm around me and I marched inside and shook the host's hand. I think it's pretty safe to say that most writers have an author crush. I am no exception. Ted Dekker makes my heart pitter-patter. That day when he held me in his arms put his arm around me will always be a personal highlight. So when I chose my 'book club outfit', it was intentional. I met him because his books move me and so I paid a stupid amount of dollars to attend a conference where he was the keynote speaker. He hugged me (whatever, let me have it!). Obviously some transference of power happened there because I went on to publish a book, and obviously the shirt I wore when we touched is the conduit of said power, so of course I had to wear it to an event where people were coming because my words moved them...beautifully perpetuating the literary circle of life. So I'm in this beautiful house filled with 13 women and there's wine and plates of crackers and brie, and there are copies of my book everywhere. We talked for a good hour and a half. They came with great insights and questions. It's amazing to think the make-belief that came from my head inspired real conversation. I expected to feel nervous and uncomfortable but everyone was so warm and inviting that I was able to set my insecurities aside. I certainly wasn't anticipating such a big group, and there were times when there were multiple conversations happening at once, but it was so exciting to be in the midst of it all. Would I do it again? Um...yeah! I already have another one lined up! I'll come to yours too if you want me—just pay for my gas if I have to travel any distance. Who knows, maybe someday I'll be someone's author crush! p.s. 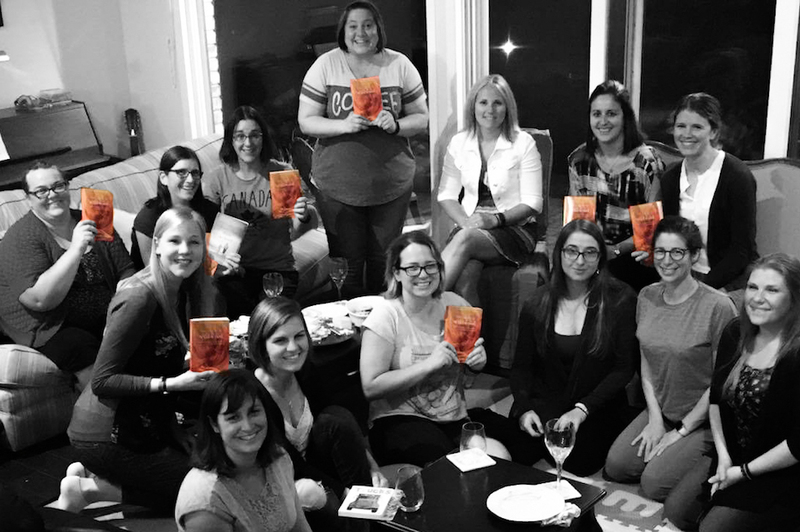 If your book club is interested in reading The Church in the Wildwood, there are discussion questions available here if you need a little help getting the conversation started.